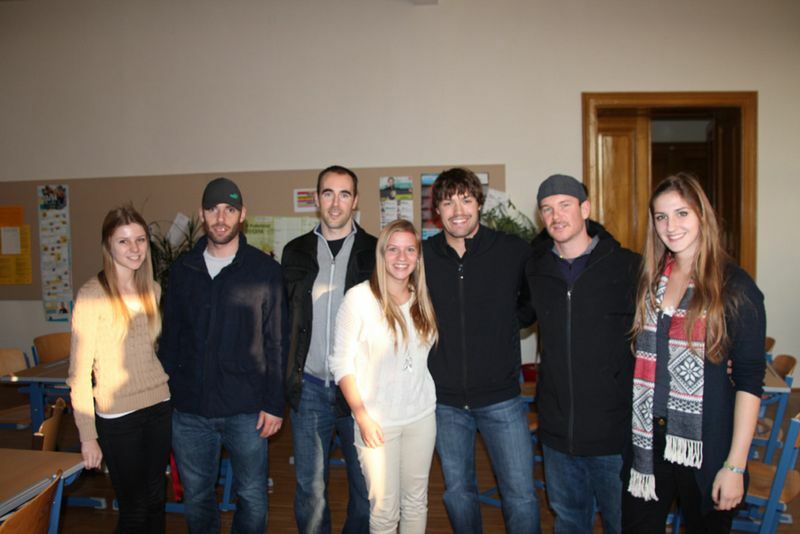 On November 12, professional ice-hockey players from the Black Wings Linz kept us company in class. Rob Hisey, Michael Ouzas, Brad Moran and Andrew Kozek spent a couple of hours with us to answer our questions - which they did patiently. We were talking about what it was like being a professional sportsman. Of course, you need to train hard and on a daily basis and furthermore take care of yourself. They always keep in mind that their body is their asset. That means, for example that they’d rather have to do without any other kinds of sports that put their physical health at risk. The Canadian hockey-stars enjoy playing in Linz. Despite missing family and friends back home, they feel quite comfortable about living in Austria. They told us that they all started playing hockey at the early age of four and were pretty determined to make their passion their profession. “Like father, like son”- this proverb is definitely confirmed by Rob Hisey’s son Hudson who has already started playing hockey for the U9 league and is also becoming quite popular, especially among the female Black Wings-fans. We would like to thank our teacher Ms Habringer and the Black Wings for giving us the opportunity to get interviews with members of our local hockey team as well as to get a glimpse at the lifestyle of professional sportsmen. Best wishes and good luck for this season!